Miniature Folding, also known as Mini Folding or Small Format Folding, is a specialized paper folding method that transforms a large sheet of paper into a very compact size. Miniature folding is important to product manufacturers because it provides a cost-effective way to fit a great deal of printed information into a tight space or small package. 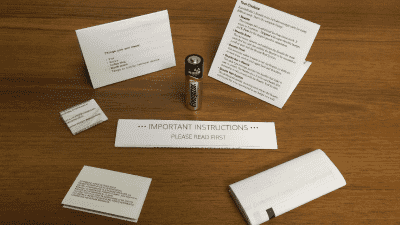 Miniature Folding allows detailed consumer data, multi-language instructions, and other lengthy info sheets to be included with a product, even when there is minimal room within the product’s packaging to do so. Any printed matter that accompanies a product in a small package is a good candidate for Miniature Folding. The printed matter may be an instruction sheet, product warranty, use and care guide, coupon, promotional literature, consumer warning, or any other information that a manufacturer wants to include with its product. Examples of manufactured items that commonly include miniature folded inserts are small mechanical parts, electrical components, health and beauty items, personal electronics and toys, household items, wristwatches and jewelry – basically anything that gets placed in a small box or clam-shell pack. 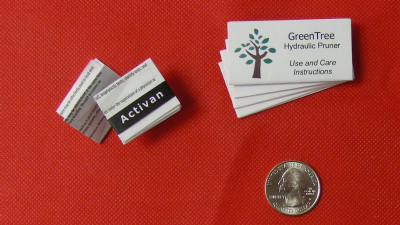 Miniature folding can also be used to create pocket-size information sheets for virtually any purpose. If you would like to explore the space-saving and cost-saving benefits of Miniature Folding, give Formax a call at (314) 434-5500 or (866) 367-6221, or simply use our quick contact form below. Let us help you develop a cost-effective solution for your specific printing and folding need!